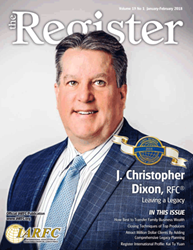 The International Association of Registered Financial Consultants (IARFC) explores the topic of “Leaving a Legacy” in the Jan/Feb issue of the Register. Our featured Registered Financial Consultant is J. Christopher Dixon (Chris), RFC® of Black Harbor Wealth Management located in Greenville and Seneca, SC, who relates his journey to a financial professional mainly dealing with clients who wish to address these needs of estate planning. With an initial background in accounting and business, Chris easily transitioned to a full service financial consultant. He attributes the somewhat easy metamorphosis to great mentors who advised him along the way. After selling a successful telecom business, he co-founded with his son Christopher, Black Harbor Wealth Management to solve the dilemma of how to deal with money realized from the sale. BHWM looks at legacy in many forms depending on the individual and their needs. They ask a great deal of questions in the client discovery phase to find out what the client really wants and then matches up a strategy with the appropriate products ranging from life insurance to hybrid annuities. For the full interview of Chris Dixon, RFC® and newly elected IARFC Board Member, visit the IARFC website http://www.iarfc.org.